Chicago Englewood High School "Eagles"
Chicago (population: 2.8 million) is the nation's third largest city that grew quickly within its first 100 years. It was the fastest growing city in the US during the second half of the 19th Century, even with a great fire in 1871 that wiped out a good portion of the city, and after rebuilding, it annexed numerous communities such as Woodlawn, Roseland, Englewood, Lake, Rogers Park, Humboldt Park, Forrestville, and Pilsen into its boundaries. Interstates 55, 57, 90, and 94 will take you to the city, along with other highways with state and US designations, train service, and air travel to/from O'Hare International Airport as well as Midway Airport, both of which serve many travelers daily. From it's founding in 1803 and even still today, the city possesses an eclectic feel with its numerous cultures and history that distinguishes the community from others world-wide. Englewood High School was located at 6201 S. Steward, about seven miles south of the Loop. The school (which later built a newer facility in 1979) was settled in an area that was called Chicago Junction or Junction Grove when railroad companies began to lay tracks and build stations as early as 1852. The area had been initially settled in 1840 by a man named Wilcox when it was a swamp, but the railroads helped change that. 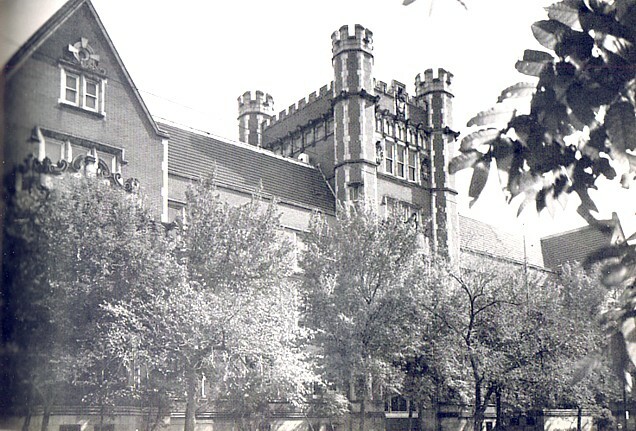 In 1868, settler and merchant Henry B. Lewis made a suggestion to change the name of the neighborhood from Junction Grove to Englewood in an effort to improve its image, and it succeeded in the degree that the Cook County Normal School (now known as Chicago State University) located in the area the same year. The school was on 10 acres between 67th & 69th Streets between Stewart and Halsted on land donated by a real estate developer. Following the Great Chicago Fire of 1871, the Englewood neighborhood became a prime location for those looking to build homes after being displaced, due to the fact that railroad service was already established. Streets were laid out in the neighborhood and the building started in 1872. The following year, Englewood High School opened up to educate the students who came from the neighborhood, starting a tradition that would last 135 years. By 1889, the city of Chicago annexed the Englewood neighborhood along with those in Hyde Park and Lake in an effort to not only reach one million in population, but to also land the 1893 World's Fair (aka the World's Columbian Exposition), which it did. During this time, Chicago and the Englewood neighborhood had immigrants from Sweden, Germany, and Ireland come in and settle, some of which were involved in a construction phase for the World's Fair. Their relocation to the area by 1920 helped push the neighborhood population to over 86,000. Over time, the number of immigrants fell below 20 percent, but the Irish, Germans, and Swedes remained the largest ethnic groups. Following World War II, the racial makeup of Englewood began to change. Up to that point, less than five percent were African-Americans that worked on the railroads, were laborers, or domestics. The Great Migration of the 1950's saw the number of African-Americans come from the South in order to gain better opportunities for themselves and their families, and as a result, the percentage of African-Americans grew in Englewood from 10 in 1950 to 69 in 1960. Part of that increase can also be accredited to the construction of the South Expressway, which today is known as the Dan Ryan Expressway, when homes were torn down to make way for the superhighway. Over time, the community and high school became nearly 100% African-American, and the societal changes that took place nationwide also affected their part of the world. 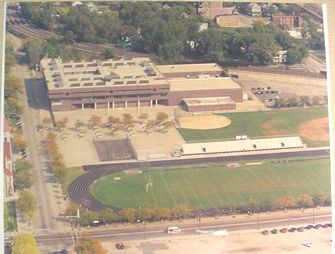 Even though Englewood built a new facility in 1979 (see photo below) to replace the one it started in (see above), it did not help as it faced the issue of preparing its students for the future. The school was on probation for a nine-year period in order to get itself up to standards that were set by the Chicago Public School system, not to mention that various attempts to improve the situation had failed. In February 2005, it was decided that due to poor performance, Englewood would be phased out over a three-year period to allow the freshmen that had entered to be the final class to graduate. That group did receive its diplomas at the final Englewood graduation ceremony in June 2008. The building is now the home of Urban Prep Charter Academy, which is an all-boys' school within the CPS system, as well as TEAM Englewood High School. Englewood was a member of both the Cook County League and its' successor, the Chicago Public High School (aka the Public League), offering boys' sports in track, basketball, baseball, football, cross-country, swimming, soccer, gymnastics, golf, speed skating, and rifle marksmenship. The female students of EHS had their choice among basketball, volleyball, softball, track, and swimmng, even though there was very little information about these sports available while researching. Anyone who has more information about these offerings is encouraged to contact us with details at dr.veeman@gmail.com. A. Vernon Hales 1-mile bike STATE CHAMPION!! T.B. Egbert 440-yd dash STATE CHAMPION!! L.V. Porter 1-mile bike STATE CHAMPION!! James Hutchinson long jump STATE CHAMPION!! Gage Leake pole vault STATE CHAMPION!! Zellner Pettet 440-yd dash STATE CHAMPION!! Theodore George 800-yd walk STATE CHAMPION!! John Maloney 880-yd run STATE CHAMPION!! Robert Maxwell shotput STATE CHAMPION!! Thomas Webster 1-mile run STATE CHAMPION!! Ernest Salmon 220-yd hurdles STATE CHAMPION!! Corson Morris pole vault STATE CHAMPION!! Walter Merrill 100-yd dash STATE CHAMPION!! Darwin Tate 880-yd run STATE CHAMPION!! Charles Bachman discus STATE CHAMPION!! Joseph Cody high jump STATE CHAMPION!! (?) Chism high jump STATE CHAMPION!! Aquila Austin long jump STATE CHAMPION!! Eddie Culp 1-mile run STATE CHAMPION!! Willie Thomas 880-yd run STATE CHAMPION!! Michael Stover 120-yd hurdles STATE CHAMPION!! Alvin Everett shotput STATE CHAMPION!! Alphonso Sanders 440-yd dash STATE CHAMPION!! AN OUTSTANDING RUN BY THE ENGLEWOOD TRACK PROGRAM!!!!! Englewood competed in the first Cook County League meet held in either the fall of 1908 or spring of 1909. From there, the school competed over hill and dale, winning 12 Public League championship, placed in the top 10 of the team standings at the state finals four times (including a second and a third in successive years), and had four individuals place in the top 10 to gather all-state honors. Englewood’s tankmen were one of the better teams in the state of Illinois when the IHSA began offering a state championship in the sport during the 1930’s. The Eagles scored three top-10 team finishes (two of them in the top five) in that era, and also were Public League champs in both the indoor and outdoor seasons. Names of coaches are unknown. The Eagles enjoyed success on the gridiron, taking home either the outright title or sharing it with another school on 14 occasions in its early years, and even won a couple of division titles as well in Public League play. It even made a playoff appearance in 1996, winning its first game in the 4A playoffs before ending its season. There have been a number of notable players that played for the Purple and White, but one has a trophy named after him: Robert Maxwell. The Maxwell Trophy goes to the top collegiate player in the country, and was started in 1937 by friends of the Englewood grad, who died from injuries suffered in a auto accident in 1922. 1958 7--0--1 Blue Division Champions!! --Tom Farris: Following graduation, Farris attended the University of Wisconsin and later played from 1946-47 with the Chicago Bears and 1948 with the Chicago Rockets of the All-American Football Conference as a quarterback & defensive back. --Ed Bradley: Bradley went on to play for Wake Forest, then was chosen in the 16th round of the 1950 NFL draft by the Chicago Bears, with whom he played with in 1950 and 1952 as a defensive end in 12 games. --Harold Bradley: This offensive guard went on Iowa, then signed with Cleveland, where he played from 1954-56. The Browns were NFL champs in 1955 as Bradley appeared in 11 games that season. Following the three years with Cleveland, Bradley played the 1958 season with Philadelphia before retiring. Englewood’s basketball program made history on March 2, 1900, when the Eagles played Elgin High School in the earliest-known interscholastic game between two prep teams in Illinois, winning that contest at Sauer’s Hall in Elgin by the score of 16-12. The school won three conference titles, four more at the lightweight division, and a "Sweet 16" showing in the last year of operation. The Eagles made history as they participated with Oak Park-River Forest in the first-known prep match between two Illinois schools, ending in a 1-1 tie in 1909. Soccer was introduced to the school in 1905 following a serious football injury, playing the Chicago Wanderers that fall and winning 4-3. The school was not able to schedule games against other schools until 1909 when OP-RF started the sport due to a football death in 1908, so they played amateur clubs until then. Archibald Patterson was the school’s first coach, and helped push the Cook County League to establish the sport in the league in 1912. Englewood won a number of Public League titles as well as the Peel Shield in the fall of 1914 as champion of the Public League and winner over the Suburban League participate in a winner-take-all game. The Eagles were a perennial contender in the CPL as well as for the Peel Shield for the remainder of the decade. The 1919 Peel Shield match versus OPRF was marred by rough play and the referee ordered an extra period of play after being knotted at two in regulation time. OPRF pulled their team off the field, despite protests by Peter J. Peel, sponsor of the title match, and that ended the series. Englewood won the CPL title again in 1922, then disbanded their program in 1925. The Eagles competed among the Cook County League and Chicago Public League teams, coming away with two singles and two doubles titles in addition to a team title. It also placed in the top three at the IHSA tournament in singles & doubles five times when the state finals were in their infancy. Englewood was a part of the Cook County High School Lawn Tennis Association tournament that was held in 1894 only. The program gained some notice in 1910 when Alexander Squair won the University of Chicago Interscholastic singles title and then followed it up in 1914 with the Western Tennis Championship. The Eagles started as early as 1890 on the baseball diamond, according to information received from historian Robert Pruter, as Englewood won three Cook County League championship during the 1890’s. As you can tell below, they were still playing up to the school’s final days. Englewood enjoyed success as a team in the sport, winning three league titles, and even having one of its own players return home with a top five finish at the state tournament during the 1922 meet. Englewood was a member of the Cook County League from 1900-1906 before the sport was banned by Edwin Cooley, superintendent of Chicago schools. The Englewood girls won the first league title in 1899-1900, and resumed play when girls' sports were re-introduced in the 1970's, but no Eagle team won a league title or qualified for the state finals. Englewood offered a team in the early 1920’s and won the senior division title at the 1922-23 Public League meet.This sport was contested all the way thru the 1970's when it was dropped by the Public League. The Eagles had both boys’ & girls’ teams in the post World War I era (1919-1929) that competed in area competition between schools from the city and possibly the suburbs, but no date is known on when the school discontinued these teams. --Patricia Roberts Harris--attorney, former UN ambassador to Luxembourg, former Secretary of HUD (Housing & Urban Development) 1977, served as Secretary of HEW (Health, Education, & Welfare) 1979-80, and Dean of Students at Howard University. --Jewel S. LaFontant-Mankarious--attorney, served as former Assistant General in US Attorney General's office, and as a US Ambassador. --Avis Lavelle--public relations specialist, former broadcaster with WGN Radio & Television in Chicago. Has served as media specialist for former President Bill Clinton and Chicago Mayor Richard M. Daley. --Merri Dee--radio/television personality with television stations WSNS & WGN in Chicago. Also worked as director of community relations for WGN. --Samuel Greenlee--writer, poet, radio talk show host. Wrote "The Spook Who Sits by the Door" and "Bagdad Blues." --Lorenzo Martin--former EHS teacher and newspaper editor/publisher. --Fred Farmer--first African-American Army paratrooper & aviation instructor for helicopters. --Maj. Robert H. Lawrence (USAF)--1st African-American astronaut and officer. Received his Ph.D. in chemistry from Ohio State, but lost his life in a test flight crash in 1967. --Sgt. Donald L. Minter (US Army)--Retired Master Sergeant and was the senior ROTC instructor at Englewood. --Dr. Walter R. Benson--chemist, pharmacist, retired Director of Drug Chemistry for the Food & Drug Administration. --Dr. Jewel Plummer--cell physiologist at California State University/Fullerton and President Emerita at the school. --Walter "Roger" Brown--former Englewood basketball player who played professionally in the NBA with the Los Angeles Lakers & Detroit Pistons as well as the hometown Chicago Bulls, plus with three teams in the former ABA following his college days at Kansas. --Dr. Henry A. Hardwick--first African-American cadet chosen to the City of Chicago's Cadet Corps, and served as manager of the State of Illinois Labor Statistics bureau. --Rudolph A. James--realtor, co-founded Ebony Real Estate in Chicago. --Larry Hudgens--entrepreneur, CEO & president of Riteway Construction Company, also served as a mentor to Chicago Public Schools. --Sheila Jefferson-Warfield--CEO of Educational Computing, Inc.
--The Barrett Sisters (Delores Barrett Campbell, Billie Barrett Greenbey, Rodesa Barrett Porter)--members of the internationally-known gospel group, "Sweet Sisters of Zion"
--Gwendolyn Brooks--Poet Laureate of Illinois and writer, was first African-American woman to win a Pulitzer Prize for poetry. --Oscar Brown, Jr.--singer-songwriter, also a poet and playwright. --Etta LaConstance Davis--international vocalist and activist, served as local school council president for EHS. --Lorraine Hansberry--playwright and essayist that wrote "Raisin in the Sun." --Jeanette K. Wilson Childress--minister, educator, and guidance counselor. --Queen Esther Richardson Crawford--served on National Baptist Convention's Foreign Mission Board. Also served as manager of the Bureau of Quality Control for the Office of the Inspector General. --Gloria J. Gibson Randolph--educator, administrator, and ordained deacon. Founded GGG (Giving God the Glory) Ministries and co-founded R.A.Y. (Reclaim A Youth). --Orietha Phillips Benton--Eductor and reading specialist. --Dr. Stephen H. Brown--former EHS principal as well as district and assistant superintendent. --Edna Alberta Dixon Bryant--served as educator for the Chicago Board of Education for 31 years. --Dr. Madie Davis Canamore--educator, consultant, writer for computer information services. --Nadine Dillahunty-Dillanado--award-winning educator, taught at EHS, and was Miss Englewood in 1968-69. --Dr. Brady J. Fletcher--professional and government educator that served as supervisor in various organizations related to education, research, and governement. --Hattie Green--served EHS for 37 years as school treasurer and payroll clerk. --Richard Hunt--sculptor and educator, taught at Illinois-Chicago, Yale, and Northwestern. --Elaine Ann Hunter--educator and assistant principal at Coleman Elementary School in Chicago. --Dr. Paulette Webb Kidd--served as assistant principal at EHS, and was student advocate. --Dr. Sarah Kidd-Burton--educator and compliance monitor for special education students. --Charles Mingo--served as principal at Chicago schools. --Nathaniel Richards--educator & counselor, served on Advisory Board for the City Colleges of Chicago. --Audrey Hoyle Cooper Stanton--educator and administrator. --Dr. Hazel B. Steward--served as a principal and was a regional education officer for Chicago Public Schools. --Mark Upchurch--Served 38 years as English teacher at EHS, was department chairman, and was a delegate on the Chicago Teachers' Union. --Rudolph A. James, received GED from EHS in after serving in World War II..was owner and founder of Ebony Real Estate at 79th and Ashland. --Dr. John A Trimble, engineering professor and two-time Fullbright Award winner. "I was reading online about Englewood High School, and wanted to add a note about the Englewood Cross-Country Team that won the Chicago City Championship seven years in a row from roughly 1948 to 1955. I ran on the team in 1953 and 1954. "I attended Englewood from January 1951 and graduated in January 1955. President Obama's mother-in-law, Marian Shields, was in our class. In my freshmen year, I took Latin and Robert Lawrence (see Famous Alumni above) was in my class, even though he was already a senior." to Harold Lee Rush for allowing us to use a couple of photos that are on this page, and well as information that we have been able to find out about Englewood High School. 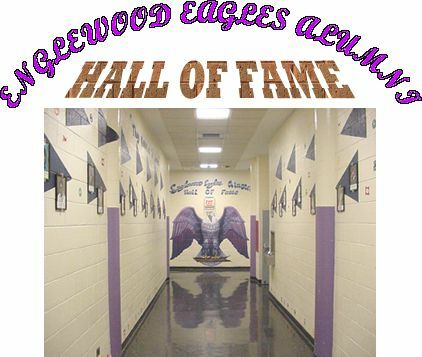 He has a website that caters to the EHS alumni and gives a great deal of information about the school's history: http://eagles.whgbetc.com/. Also, kudos to Tom Sikorski and Robert Pruter for the information they have compiled on EHS.